Love Simplicity! Pack it up without looking into multiple pockets. Our classic Klettersack. An ideal travel companion, workmate or pack mule for the daily hike in the hills. We use 1000d Cordura for the exterior and coated pack cloth for an entirely lined inner compartment. Our natural leather lash tabs are perfect for securing extra gear or attaching a bike light. All of our bags are handmade in our LEED Certified shop here in Colorado. Features: Natural leather lash tabs, plastic and metal military spec hardware, heavy duty straps reinforced with seatbelt webbing, inner drawstring closure and zippered top pocket. Simple, it is amazing that simple solutions can still be created to old problems. 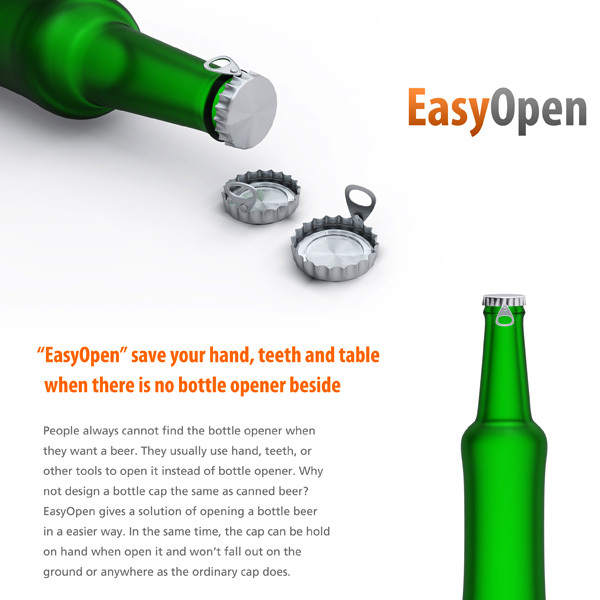 Being without a bottle opener has happened to all of use, try to use your wedding ring, side of a table, even your teeth can have there own problems. Well easy open, Designer: Gonglue Jiang is the answer.